Looking for something fun for your child this summer? Add your Summer Camp Program to our page. Click here for details. Two week STEAM Camp for kids entering 1st grades to 5th grades in the fall. M-F 8:30a to 3:00p. All on-site, hands-on building, coding, experiencing and exploring through STEAM lessons interrupted by sports in the gym. Two -week STEAM camp with visits from area conservation groups, LEGO-inspired labs, sports, art and more. Two week STEAM camp with lots of building, engineering, challenges, and launching. Using LEGO bricks, motors, robots, and other building materials. Register Online -- camp is limited to 28 kids. Aloha Camps offers Water Sports, Surf, and Teenage Camps. We Have Full Day and Half Day Camps with Before and after care. Instructors are C.P.R. certified. Beginning to Advanced instruction. First time students learn to surf in a safe professional enviroment with C.P.R. certified instructors. Ocean Safety & ocean awareness education. Students will also learn how to identify rip currents and what to do scenarios. Activities include surfing, water trampolines, jet ski rides and tubing, beach games, skimboarding, paddleboarding, bodyboarding, snorkeling,and shark tooth hunting, surf contest, talent shows and visits to Marine Life Center. Discounts for siblings and groups! Prizes and giveaways for everyone! Each student will receive free hats, posters, surf stickers, and sunglasses from Oneill !! Free Pizza Party fridays from Dominos pizza! All included! Dance, act and sing the summer away at ArtStage Performing Arts Center! A family-friendly learning environment for kids of all ages! All day camp & half-day camps available. Check out our website www.ArtStagePerformingArts.com and sign up today! Theatre Camp includes: improv, monologues, scene study, writing, commercials, musical theatre AND a weekly performance showcase! Dance Camp includes: ballet, jazz, tap, acrobatics, modern and hip hop with a performance at the end of the four weeks! Children have a captivating experience discovering Florida ecosystems, collecting fascinating marine critters, and caring for their own aquarium! With 4 counselors and just 16 campers per week, kids will explore the Loxahatchee River from the ocean’s beautiful reefs to the freshwater cypress swamps at Riverbend Park in a safe, personal environment. Adventurers will get “hands-on” with the Loxahatchee, hiking & kayaking to diverse local habitats, participating in exciting eco-games, and seining and dip netting in the clear waters of Jupiter! Stand UP with Camp H2O! We are partnering with Stand Up Foundation to offer the BEST camp experience EVER. Each week we will be offering a different theme to support our healthy kids and teens. Morning activities will include anything from paddleboarding, surfing, snorkeling, fishing, yoga and surf condition/water safety awareness. In the afternoon, SUF high school members will help guide leadership activities (facilitated by our director), that will focus on the theme for the week helping them to develop a healthy life style in a fun, interactive way. Various locations within the city limits of Boynton Beach including the Civic Center, Harvey Oyer Park, Intracoastal Park, Hester Center and Sims Center. Summer camps provide time for kids, ages 5 - 12, to play outside, use their imaginations and enjoy fun-filled field trips and cool days of swimming. Campers will experience age-appropriate activities, arts and crafts, indoor and outdoor games and tons of fun. Information on each camp can be found on the city's website or by calling 742-6240. We build, play and learn with LEGO bricks, motors and gears. We also introduce coding by teaching kids to control the movements of their LEGO models with computer programs. Two half-day STEM enrichment programs are offered in the summer at STEM Studio. Master Builders in Training for kids entering K and Summer Mash-Up for kids entering 1st - 3rd grades. Full and half-day All Star STEAM Camp is offered at Trinity Christian School. Extended care is also available before and after camp hours for an additional fee from 8 am to 5 pm. Wear comfortable clothes and tennis shoes. Bring lunch and snacks. Pizza on Fridays for $3.00. early is strongly advised for the best class selection. List any medical conditions and/or allergies on registration form. We also offer art classes, BAK & Dreyfoo skill building classes, birthday parties, Girl's Night Out and office parties. Designed to teach, challenge, and entertain young athletes. 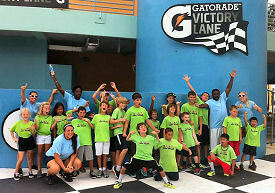 We offer different sports camps for boys and girls all Summer, Spring Break and Christmas Break. We run Summer camps for baseball, basketball, flag football, fishing, soccer, karate, dance & cheerleading, and more. We’re pleased to be offering “Camp Varsity” for 9 weeks a summer. Camp Varsity is a full day sports camp located at Wellington Landings Middle School and Watson B. Duncan Middle School. We also offer many other exciting programs such as sports themed birthday parties and sports clinics. 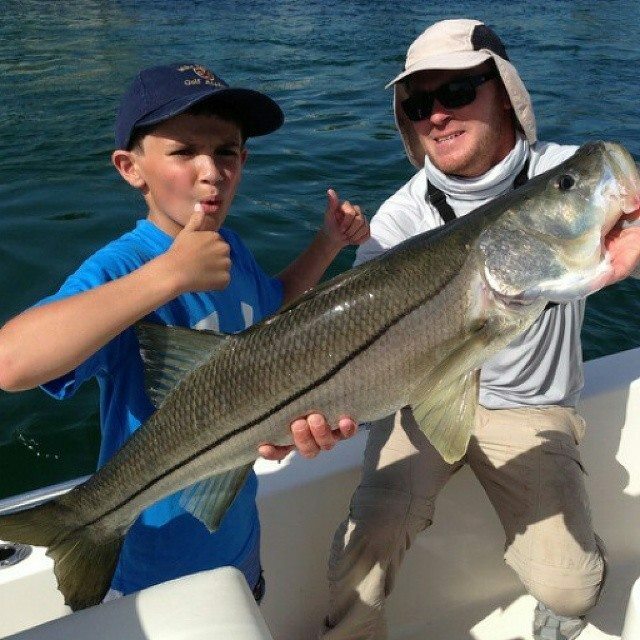 Jupiter Fishing Academy is an educational fishing adventure designed by Captain Matt Budd to teach kids everything from boating safety, waterways, navigation, weather, fishing and much more! We will be up the Loxahatchee river and out to the deep blue gulfstream. The boat is a 27' Goldline. Camp begins June 1st and runs through the entire summer break. Week classes are Monday, Tuesday, Thursday and Friday. Drop off is 8 am and we return at 12:30 pm with many storys to tell! At The Jupiter Outdoor Center we believe that interaction with nature is vital to a child's development and in order to love and respect nature, one must experience being nurtured and inspired by it. 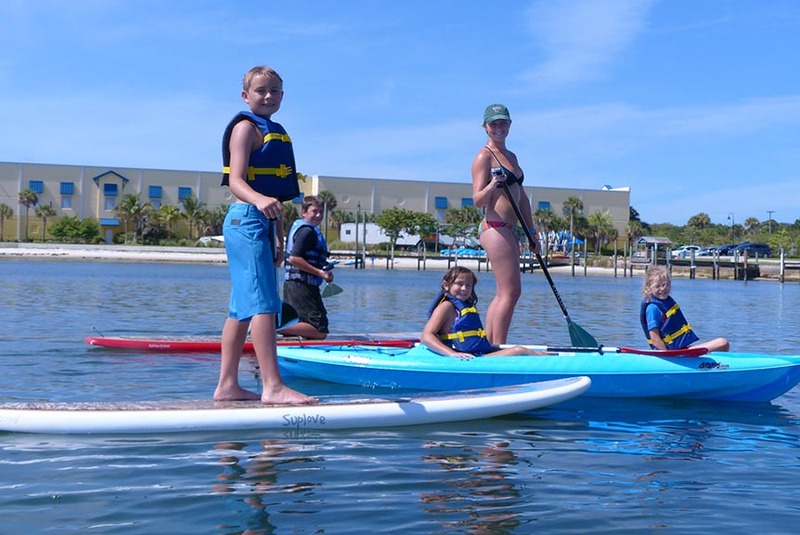 Since 1997, JOC “paddle camp” has had the privilege of turning thousands of kids onto nature by teaching them how to kayak, stand up paddle board, skim, surf, snorkel and fish all while having good old summer-time fun. Paddle Camp began at its former location at Guanabanas. Now camp will be held at The River Center and the Jupiter Outdoor Center, with its sandy beach and sand bar on The Jupiter Inlet across from the historic Jupiter Inlet Lighthouse. JOC’s team of first aid certified and ACA trained counselors along with some of the best environmental educators in the area from The River Center are committed to making paddle camp 2014 one of the most fun and rewarding experiences for your child this summer! Visit www.JupiterOutdoorCenter.com to view more information and to register or call 561-747-0063. John D. MacArthur Beach State Park will offer six weeks of camp programs, giving young naturalists the opportunity to learn about the coastal ecosystems of south Florida. Sunshine Kids Camp (1st/2nd) will introduce campers to basic environmental concepts. Junior Rangers (3rd/4th) explore the ecosystems collecting data for comparisons of the systems. Marine Biology (5th -8th) participate in a variety of scientific investigations conducted throughout the Park. Visit our website at www.macarthurbeach.org/summer-camp to learn more. 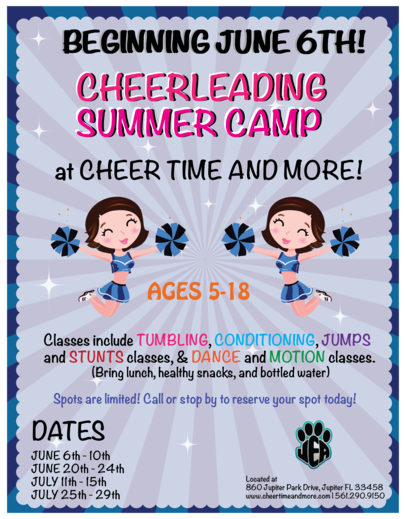 Keep Flippin’ Gymnastics offers a fun filled summer camp! Every morning there will be over 4 hours of gymnastics! Our full day camp offers exciting afternoon activities and field trips including ice skating, roller skating, children's museums and the waterparks! You can choose to sign up by day, week or month. Click here for a full list of camp activities. You must come in to register for the first time and choose your days. "Color Our World" with Kids Need More Art's 2018 Summer Art Series for elementary aged artists ages 5-12! Offered weekly from June 4th to August 10th at the Jupiter studio in Downtown Abacoa, as well as select weeks in West Palm Beach at the beautiful 135-acre preserve of the Pine Jog Environmental Education Cente, with a new theme every week! Full and extended day options available at both locations. For more information and to register, visit www.kidsneedmoreart.com. Registration/Sign up Procedure: Advance registration and payment required. Visit www.kidsneedmoreart.com to register. For More Information: Call 561-746-4576 or email info@kidsneedmoreart.com. Visit us on Facebook where you can see photos of our art projects and keep up with our latest activities. Loggerhead Marinelife Center’s summer camp programs are interactive, educational and stimulating. Each camp is geared towards children ages 6 through 17. Students participating in the Jr. Marine Biologist summer camp program will gain an understanding of various nature-related topics such as ecology and marine biology, with an emphasis on conservation. Camp hours are Monday – Friday, from 9 a.m. to 4 p.m. Late pick-up (5 p.m.) is available for an additional fee. Explore Florida’s coastal ecosystems and all the marine animals that live there! Campers will journey from mangroves to coral reefs as they explore different habitats for the incredible diversity of flora and fauna. Campers will learn about the importance and complexity of coastal habitats, learn to take samples and use observation to collect data, enjoy snorkeling excursions, and more. Ocean Adventures encompasses sea turtles and their marine environment as well as behind-the-scenes access to our sea turtle hospital. Join us for our all-new camp session dedicated to aspiring sea turtle researchers, veterinarians and biologists! Our Sea Turtle Savers session will give your sea turtle lover an opportunity to be a marine science researcher, veterinarian and marine biologist throughout the week for a hands-on experience they won’t soon forget. Campers will learn the process of rescue to release as they participate in rescue and rehabilitation simulations, take a behind-the-scenes tour of our sea turtle hospital, learn how to conduct a sea turtle nesting survey and spend a day in the life of LMC staff. Ready, set, SAVE! Watch as your child turns from camper to Conservation Kid as they learn the importance of ocean conservation for sea turtles, the ocean and their future. Campers will learn how to responsibly enjoy the outdoors while having fun fishing, canoeing and snorkeling safely for marine life. Each Conservation Kid will receive a Sea Turtle Safety award upon completion of the camp session and leave with tools and resources to implement responsible practices in their own community. Register at www.marinelife.org/camp and click on your desired week to sign-up! Where can you find characters from Scooby Doo, Monsters, Inc., SpongeBob SquarePants and large-scale kids’ musicals under one roof? At the Maltz Jupiter Theatre’s popular Goldner Conservatory of Performing Arts camp programs, of course! With a flexible schedule, budding young performers will participate in a broad range of theatre-related activities, including acting, dancing, singing, prop-making, improvisation, storytelling and more. Many of the summer camps conclude with unique themed showcase performances. The two largest camp shows will be performed on the Theatre’s stage: the Senior Conservatory’s Sister Act and the Junior Conservatory’s The Wizard of Oz, Young Performers’ Edition. The musicals will be performed complete with professional production values: sets, costumes, lights, a full orchestra and more. Enrollment fees are all-inclusive, covering all costumes and performance-related costs. Students in grades 6 – 12 will rehearse and perform Sister Act on the Maltz Jupiter Theatre stage. The production camp includes three full weeks of instruction, rehearsals and costumes for both performances; all students will be a part of the production, with auditions held for placement only. The production will be led by Ricky Nahas, John Mercurio and Keagan Cerny. Monday – Friday, 9 a.m. – 3 p.m.; $810. Performances will take place June 22 and 23 at 7:30 p.m.
Students in grades K – 2 will explore acting, voice and movement with a Winnie the Pooh theme, culminating in a showcase for family and friends on June 29 at 2 p.m. in the Conservatory. Monday – Friday, 9 a.m. – 3 p.m.; $215. Students in grades 3 – 5 will explore acting, voice and movement with a SpongeBob SquarePants theme, culminating in a showcase for family and friends on June 29 at 3 p.m. in the Conservatory. Monday – Friday, 9 a.m. – 3 p.m.; $215. Under the guidance of Conservatory faculty member Alexa Evans, students in grades 6 – 12 will experience one week of “dance intensive” camp, focusing on ballet, jazz and tap. There will be no showcase performance; classroom content is technique-focused only. Monday – Friday, 9 a.m. – 3 p.m.; $215. This summer, enjoy summer camp with Drama Dragon! Students in grades K – 2 will explore acting, voice and movement with a Drama Dragon theme, culminating in a showcase for family and friends on July 6 at 2 p.m. in the Conservatory. Monday – Friday (no class Wednesday, July 4), 9 a.m. – 3 p.m.; $175. This summer, enjoy summer camp with Drama Dragon! Students in grades 3 – 5 will explore acting, voice and movement with a Drama Dragon theme, culminating in a showcase for family and friends on July 6 at 3 p.m. in the Conservatory. Monday – Friday (no class Wednesday, July 4), 9 a.m. – 3 p.m.; $175. Under the guidance of Broadway professional Brian Andrews, students in grades 6 – 12 will experience one week of “dance intensive” camp, focusing on ballet, jazz and tap. There will be no showcase performance; classroom content is technique-focused only. Monday – Friday, 3:30 p.m. – 8:30 p.m.; $215. Students in grades 3 – 5 will rehearse and perform The Wizard of Oz, Young Performers’ Edition on the Maltz Jupiter Theatre stage. The production camp includes three full weeks of instruction, rehearsals and costumes for performance; all students will be a part of the production, with auditions held for placement only. The production will be led by Ricky Nahas and John Mercurio. Monday – Friday, 9 a.m. – 3 p.m.; $810. Performances will take place July 27 and 28 at 7:30 p.m.
Students in grades K – 2 will explore acting, voice and movement with a Finding Nemo theme, culminating in a showcase for family and friends on August 3 at 2 p.m. in the Conservatory. Explore musical theatre and “just keep swimming!” Monday – Friday, 9 a.m. – 3 p.m.; $215. Students in grades 3 – 5 will explore acting, voice and movement with a Kung Fu Panda theme, culminating in a showcase for family and friends on August 3 at 3 p.m. in the Conservatory. Monday – Friday, 9 a.m. – 3 p.m.; $215. Under the guidance of Broadway professional Brian Andrews, students in grades 6 – 12 will experience one week of “dance intensive” camp, focusing on ballet, jazz and tap. There will be no showcase performance; classroom content is technique-focused only. Monday – Friday, 9 a.m. – 3 p.m.; $215. Registration is now open for the Conservatory’s vacation camp programs. Call 561-575-2672 for more information or register online at www.jupitertheatre.org/education. Drawing nearly 600 students per year, the Maltz Jupiter Theatre Goldner Conservatory of Performing Arts is a premiere professional Conservatory that offers a challenging, innovative and quality theatre experience to students of all ages and abilities. In addition to a full schedule of classes, the Conservatory's hands-on workshops and master classes offer students an opportunity to learn first-hand from nationally known directors and Broadway performers, agents and local instructors. More than 25 percent of the Conservatory’s students receive scholarships. For more information about the Conservatory including a full schedule of classes, visit www.jupitertheatre.org/education. 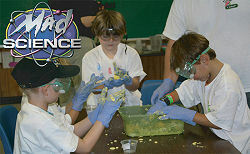 Mad Science offers a wide range of camp programs designed for ages 4-12. Our science camps will fascinate kids with rockets, robots, chemistry, engineering, forensics and more. All of our science camps are filled with STEM (science, technology, engineering, and mathematics) learning. Science camps are a great way to encourage kids to think about science even when school is out. In fact, your child will have so much fun they'll forget that they're learning! All children need to bring is a snack, lunch, water bottle, sun screen and a smile!!! OPEN TO AGES 4 TO 16 YEARS - All Levels and Abilities are Welcome........So if you are a new player trying soccer for the first time - or a player wanting to sharpen your skills....THIS CAMP IS FOR YOU!!!!! My Gym camp is simply the best! Children participate in energizing fitness games, noncompetitive gymnastics, arts and crafts, music and so much more. Each camp program is uniquely designed to keep your children moving and active, as we emphasize physical development and personal success. Our themes and programs change daily, so no two camp days at My Gym are ever the same. 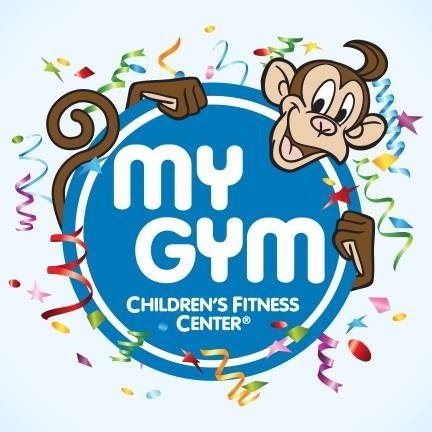 Whether you are looking for the best place to send your children on cold and rainy days or trying to keep them active and cool during the hot summer months, My Gym camp is the place to be. We make it easy for parents with our drop-off program, pay-by-the day options, and multi-day and sibling discounts. NB Tutoring offers two specialty camps with specific themes and activities for children aged 8 to 14. Our Harry Potter themed summer camp focuses on all things Harry Potter and includes tons of activities and challenges for all Harry Potter fans, whether they’ve read the books, watched the movies, or not! Students will receive their Hogwarts acceptance letter via Owl and must be ready to board the Hogwarts Express at 4179 Main St. in Abacoa on the specified date. From there they will explore Diagon Alley, picking up their supplies for Hogwarts. Once at Hogwarts, they will be sorted into their houses and learn how to mix potions, cast spells, and attend Charms, Herbology, and Defense against the Dark Arts classes. They will work with their housemates for points to win the House Cup at the end of the week, where we will celebrate with a feast! Our Girls who Glitter group focuses on empowering young girls. We incorporate fun and exciting crafts with workshops and activities on a variety of topics relevant to girls in elementary and middle school. Our workshops include learning how to be safe on online, embracing our personalities and developing empathy. We also focus on how technology and social media can impact our lives, how to practice self-care in the face of anxiety and stress, as well as how to deal with friendship issues, conflict, and bullying. The girls will have a ton of fun learning about themselves and others, becoming more confident in their skin, and creating and building different arts and crafts. We offer nine one week sessions, June 8-August 7, for children 9-10 years old (age as of 9/1/2014) who want to experience a variety of activities. We follow a 1:12 staff-to-camper ratio. Campers need to bring their lunch, snacks and drinks daily in an insulated lunch box. The Dolphins fill their days with swimming, team sports, gym games, board games, game room activities, outdoor play, movies and crafts. The Dolphins will take a field trip each Thursday. Teens can stay active this summer instead of being in front of the TV or video games and can give back to the community at the same time. Each day begins and ends at the Burns Road Recreation Center. We will go on field trips to various agencies and locations to help with community service projects. Projects could range from beach clean-ups and landscaping beautification to helpin at a food band and writing letters to active military personnel. Pack a lunch, snack and beverages daily. Bring sunscreen and hat, as many projects will be outdoors. Please verify with your school that community service hours completed during the summer will be accepted toward your school requirements. We offer nine one week sessions, June 8-August 7, for children 7-8 years old (age as of 9/1/2014) who want to experience a variety of activities. We follow a 1:12 staff-to-camper ratio. Campers need to bring their lunch, snacks and drinks daily in an insulated lunch box. The Marlins fill their days with swimming, team sports, gym games, board games, game room activities, outdoor play, movies and crafts. The Marlins will take a field trip each Wednesday. We offer nine one week sessions, June 8-August 7, for children 11-13 years old (age as of 9/1/2014) who want to experience a variety of activities. We follow a 1:12 staff-to-camper ratio. Campers need to bring their lunch, snacks and drinks daily in an insulated lunch box. The Dolphins fill their days with swimming, team sports, gym games, board games, game room activities, outdoor play, movies and crafts. The Dolphins will take a field trip each Tuesday and Friday. We offer 9 one week sessions, June 8-August 7 for children 5-6 (age as of 9/1/2014). We follow a 1:12 staff to camper ratio. Campers need to bring their lunch, snacks and drinks daily in an insulated lunch box. Each day begins and ends at Riverside Youth Enrichment Center. Campers will take local field trips to parks, the movies and the Burns Road Recreation Center for swimming and other activities. The Palm Beach County Health Department also requires anyone entering Kindergarten, or anyone form another state/country, to have a Florida physical form and shot record on file with Riverside Youth Enrichment Center before attending camp. A copy of your child's birth certificate may be requested at registration. Join us for an exciting line up of Summer Adventures at the new STEM Studio in Jupiter! With interactive activities offered by the South Florida Science Center and Aquarium, this series of camp is sure to send your kids back to school with a new love of learning. Themes include Jedi Science Academy, H2Ocean, 3D Printing, MinecraftEDU and more! Affordable pricing and convenient location. Camp is 9am - 4pm and prices vary for the 1-week sessions. Get up out of your seat and join us for a week of jumping, spinning, lifting, and running as we push our bodies and minds to the limit! Study the different body systems, learn about how muscles grow, and prepare yourself for our exciting Science Gauntlet to finish the week. You ready for it? July 2-6, 2018 *4 Day Week* (Ages 7-12) - MinecraftEDU: Calling All Mods! Harness the power of MinecraftEDU as we take the customization to the next level! Get some advanced training in computer science creativity by learning how to make your own mods to change the MinecraftEDU world like never before. How crafty will you get? Surf’s up scientists! We’ve got a wave of wonder washing up at our doors. Test the waters as we meet our favorite aquatic companions, dive into the ocean abyss, and go on an anatomy adventure! July 16-20, 2018 (Ages 7-12) - Draw, Design, Discover! Bring your imagination to life with a week of 3D printing and design! Learn how 3D printers have changed the way we engineer and create your own 3D models from sketch, to design, to 3D-printed prototype. Answer the call of the Jedi as we travel deep into space to find out who can master the final frontier. Learn about deep space and the wonders it holds as we train you to use the force and navigate the galaxy! Coding is the skill of the future! Type, click, and think your way through coding challenges as we teach you the FUN-damentals of the computer language. Get a step ahead and gain the coding foundation needed for the jobs of tomorrow. Please visit our website www.sfsciencecenter.org/stem-studio-camps or call (561) 832-2026 to register today. We recommend that all campers wear comfortable shorts, t-shirts and gym shoes each day. Please provide sunscreen, lunch and extra drinks daily. Registration begins February 10 at any one of the Recreation Centers located in Palm Beach Gardens. Registration at this time must be done in person. Our motto is "safe, fun, and secure". We stay on campus! Water slide every Thursday. Pizza Day on Friday. First aid and CPR certified. Number one private camp in Jupiter for 16 years! Stand UP’s Retreats are designed for tweens and teens in 4th-8th grade and are gender specific, except for our epic camp wars on Fridays. We encourage confidence building, making new friends, finding healthy new solutions and productive outlets all while having a whole lot of fun! SUF is passionate about prevention and driven to help “healthy kids stay healthy”. Although this is NOT a therapeutic environment, we do center our activities around themes based on the normal challenges of adolescence. We have a great team of outstanding high school camp counselors who gladly volunteer their time to provide leadership and healthy role modeling. Our retreats offer a truly unique way to spend the summer and a place to gain invaluable leadership and life skills. We offer a dynamic set of programming developed to suit a wide array of interests and learning styles ranging from games, small group discussion and workshops, and outdoor and physical activities like beach days, excursions to the mall, put-put golfing, and even paddle boarding and yoga. This year, we are very excited to announce more partners that are eager to ensure a diverse, unique and incredible time! Each afternoon will be a different offsite activity, including at least 2 afternoons paddleboarding with Blueline Surf and Paddle CO (including one with yoga paddling), 1 afternoon with Loggerhead Marine Life Center; including a beach clean up and field trip, one afternoon with Absolute Music Studios; learning song writing skills and becoming familiar with different instruments, and so much more! 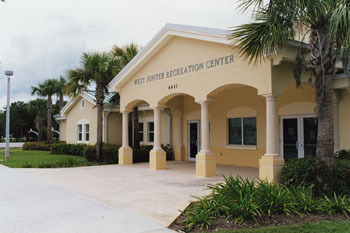 Additional camp details can be found on our website www.jupiter.fl.us/recreation or call the Jupiter Recreation Division at (561)741-2400. The camp is designed to create an economical, active, safe and fun summer adventure for Jupiter children, ages 5-13. Each age group will have a schedule of activities which may include a variety of team sports and games, arts & crafts, board games, quiet games, guest speakers, cooking projects and field trips. For the 5 year old group, parents can expect their children to be on-site 4 days a week and off-site on a non-optional field trip 1 day. For ages 6-13 parents can expect their children to be on site at the Community Center for 2.5 days and off-site on non-optional field trips for the other 2.5 days. •For the 5 yr old group, the child must turn 5 by June 15, 2015. •For age groups 6-13, child must be at least 6 years old, but not older than 13 years old, prior to or during camp to be eligible to register; sorry but we can't make any exceptions. •A child is too old if they turn 14 prior to the start of camp. •A birth certificate (or copy) is required at registration for all NEW CAMPERS.